Hugo Boss will open a 3,500 square foot store at Calgary's Chinook Centre. The store will be located in the 'older' part of the mall, away from other similarly upscale stores that have located in the mall's most recent expansion. The store will be next to an existing Williams Sonoma store, as per the floorplan below. The store will join other upscale mall tenants including Burberry, Tiffany & Co., Tory Burch, Coach, Lacoste and others. These tenants are all located in the mall's newer section. Chinook Centre is one of North America's most productive shopping centres with sales of $1107/square foot, according to landlord Cadillac Fairview. Mall anchor Hudson's Bay is undergoing a multi-million dollar renovation that will include new interior design and a 15,000 square foot TopShop/TopMan store. Target recently opened a 115,000 square foot store in Chinook Centre, and Nordstrom will open a 140,000 square foot store in Chinook Centre in the fall of 2014. Thank you to Retail Insider Trevor Hanlan for information on this article. "Calgary", "Chinook Centre", "Hugo Boss"
We're updating you on three announced Canadian TopShop locations. Interestingly, some of them will be almost as large as the TopShop/TopMan concession inside of Toronto's flagship Hudson's Bay ("Queen Street") store. The mall-based TopShop/TopMan stores will be given prominent mall-entrance locations with the intention of drawing more shoppers to their adjacent Hudson's Bay stores. An example is the image above, showing Canada's first TopShop/TopMan at Toronto's Yorkdale Shopping Centre. Chinook Centre, Calgary. Lease plan: Cadillac Fairview. Calgary's previously announced TopShop/TopMan will be configured adjacent to the main entrance of Hudson's Bay. Adjacent mall space, circled in red, has been acquired to give a stronger mall-front presence for TopShop. The Chinook Centre TopShop/TopMan will be about 15,000 square feet according to a source at Hudson's Bay. The previously announced TopShop/TopMan at Mississauga's Square One Shopping Centre also includes annexed retail space, as per the lease plan below. Mississauga's TopShop/TopMan will be 18,000 square feet, just 1000 square feet shy of Downtown Toronto's Queen Street Topshop/TopMan. The TopShop/TopMan concession at Toronto's downtown Hudson's Bay flagship ("Queen Street") is about 19,000 square feet, while the Yorkdale Shopping Centre TopShop/TopMan is just shy of 15,000 square feet. The largest TopShop/TopMan store outside of England is at Vancouver's Hudson's Bay store, with about 33,000 square feet of retail space and close to 40,000 square feet in total. Our Montreal Retail Insider Pat Campione tells us the suburban Montreal (Le Carrefour Laval) TopShop/TopMan is scheduled to open in August. We are awaiting further details of this and the other Montreal TopShop location we announced last week. "Calgary", "Chinook Centre", "Hudson's Bay", "Le Carrefour Laval", "Square One Shopping Centre", "TopMan", "TopShop"
TopShop/TopMan will open in November at the Hudson's Bay store in Calgary's Chinook Centre. This will coincide with a complete renovation of the Hudson's Bay store. Both are in anticipation of the opening of Nordstrom and Target stores in the same mall. The 203,000 square foot Hudson's Bay store will see a top-to-bottom renovation and we have been told that it will be of a similar 'look' to the recently renovated Yorkdale Shopping Centre Hudson's Bay Store. 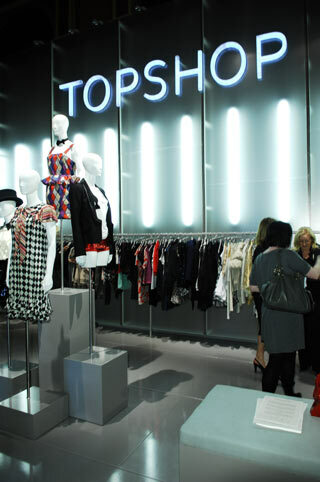 We have yet to get details on the size of the TopShop/TopMan shop-in-store. Calgary's Chinook Centre will see two new anchor tenants in the next two years. Target will open a 115,000 square foot store in May, and Nordstrom will open a 140,000 square foot store in the Fall of 2014. Chinook Centre recently saw a $277 million, 180,000 square foot expansion and the mall is slated for another expansion in the next couple of years. We have an insider looking to obtain plans of Chinook Centre's next expansion. Chinook Centre is one of North America's most productive malls. It sees sales of almost $1,100/square foot and by 2016, it is expected to have sales of close to $1billion with non-anchor sales of about $1200/square foot. These numbers come from this Calgary Herald article. *UPDATE* This store opens Wednesday, June 5th 2013. J. Crew will open its ninth Canadian store at Calgary's Chinook Centre. The store will be about 4200 square feet and will carry both men's and women's collections. Last week we announced J. Crew would open a second location in Downtown Vancouver. J. Crew has two stores in Edmonton and four stores in the Greater Toronto area. Interestingly, Calgary's J. Crew store will be located next to an Ann-Louise Jewellers store. This is also the case with J. Crew's new Vancouver Pacific Centre store. We've been told that J. Crew is seeking space in Ottawa and possibly Winnipeg, among other Canadian cities. We'll update readers when more information is available. "Calgary", "Chinook Centre", "J. Crew"
Calgary's Holt Renfrew store will expands its retail space by about 30,000 square feet within the next year, occupying unoccupied space on the store's fourth floor. This is partly in response to Nordstrom's announcement of a new store at Calgary's Chinook Centre Mall. The Calgary Holt Renfrew store currently utilizes about 120,000 square feet of its 151,000 square foot gross space. The 30,000 square feet on the store's fourth floor (aka +45 Level) has been vacant since the store opened in a former Sears location October 2009. Holt's didn't want to initially 'overwhelm' the Calgary market with a 150,000 sq ft store after its previous location was only 42,386 square feet. Holt Renfrew is examining the possibility of opening a restaurant, spa, and private personal shopping suites in the space. Holt's is also looking to expand its contemporary apparel for women, and may consider a combined men's/women's department similar to what will be built in the Holt Renfrew Yorkdale Shopping Centre expansion as we previously reported. Calgary's original downtown Holt Renfrew was at Penny Lane Mall (R.I.P. ), and was only about 16,000 square feet. A second small Calgary location was at Chinook Centre. Both closed, and a replacement store opened at the Calgary Eaton Centre in 1988 at about 27,343 square feet. Be sure to follow us on Facebook and twitter, as we provide interesting updates not posted on this website. "Calgary", "Chinook Centre", "Holt Renfrew", "Nordstrom"